Bavaria is the country with the most types of beer in the world. For many, Bavaria is the home which best beers in the world. That beer in everyday life is so obvious, is for guests of "puritanical countries" very unusual. There are also countries which sell beer only regulated and high taxed. In Bavaria this will be an unthinkable act. In addition to the best beer in the world, Bavaria also has the densest “long distance bicycle path network” in the world. Over 80% of the route you ride on "car-free" cycling routes in a varied landscape. The remaining distancest leads you on quiet side roads. 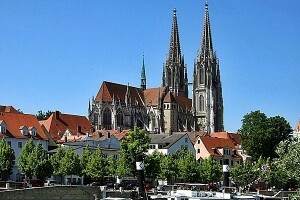 You are visiting on this trip wonderful cultural cities such as Nuremberg and Regensburg. 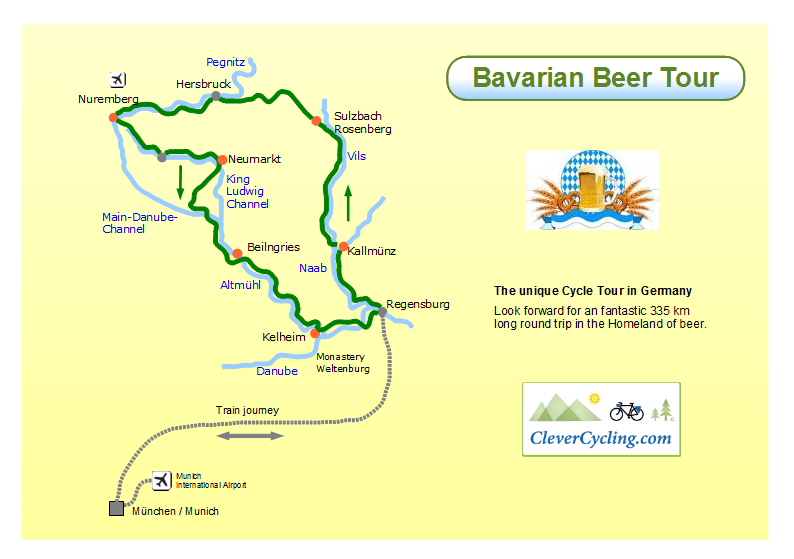 Look forward to an unforgettable cycling trip through the Homeland of the beer. Ideal starting locations for this tour are the cities Nuremberg or Regensburg. Both cities are easily reached from Munich by train. Nuremberg even has an airport with daily direct flights to London (all airports), Paris (Charles de Gaulle), Barcelona and Istanbul. 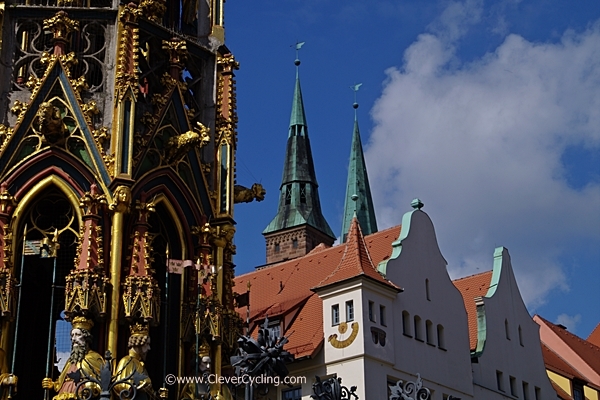 On this tour you get to know two different cultural groups know (Old Bavaria and Franconia). This journey leads you through five magnificent river valleys. Over 80% of the cycle-trails are car-free! The profile of the route is mostly flat. Therefore, this trip is very well suited for families with children over 7 years. Other advantages: Our office is near the cycle track close to Nuremberg. All customers are welcomed by us personally. At three stage destinations and in Munich we offer you a delicious dinner with a half a liter of Bavarian beer of your choice! 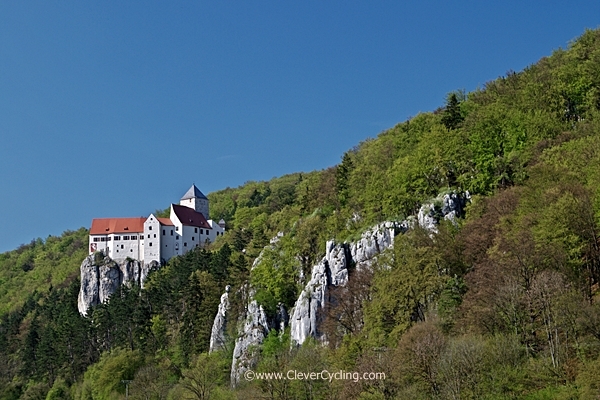 Your journey begins with a train ride from Munich to Regensburg. Duration: 1:40 hours. Regensburg is over 2000 years old and therefore the oldest city of Bavaria. The picturesque old town is a UNESCO World Heritage Site. Because the day's stage is short, you can go for a stroll around the historic old town. After the many cultural impressions, a kind of exercise will be good. 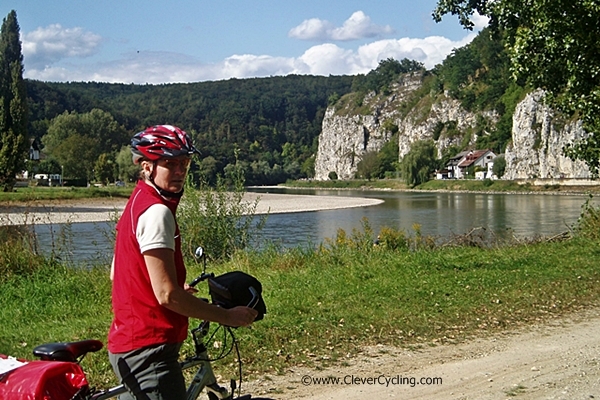 A pleasant cycle path takes you first along the Danube River, then along the river Naab to your destination. We offer you a good dinner in a modern Bavarian guest house. In this section you come through the village Kallmünz. For many Kallmünz is the most beautiful village in Bavaria. Located at the foot of a high cliff where two rivers meet, guarded by an ancient castle ruins. Numerous artists have their ateliers here. 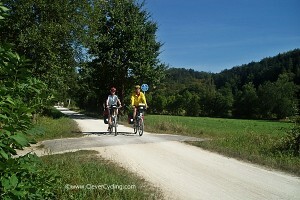 The further way to the next destination leads to beautiful cycling routes through a partially picturesque river valley. Again, you expect a plentiful dinner with a very good beer of a small private brewery. The longest stage of the journey is imminent. 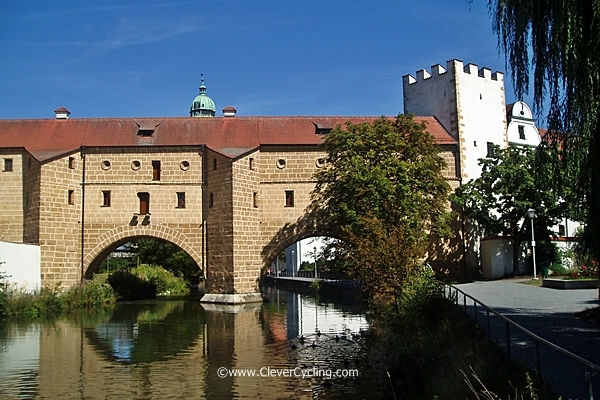 By broad river valleys with lush green mountains your path leads to the Franconian metropolis Nuremberg/Nürnberg. The small town of Hersbruck is worth a stop. The historic center with half-timbered houses offers numerous photo motives. 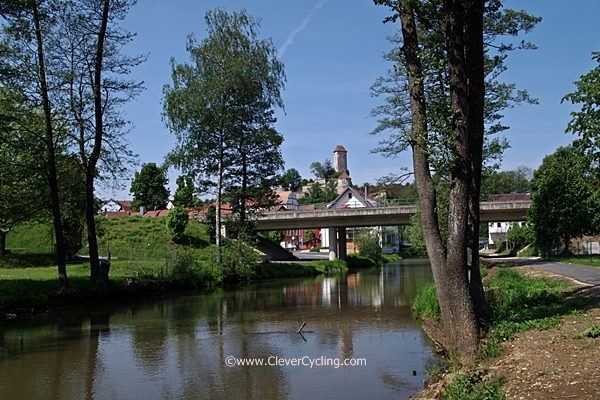 Along the river Pegnitz you ride on comfortable trails to the center of Nuremberg. The historic old town is dominated by the mighty Imperial Castle/Kaiserburg. By the way, Nuremberg has the largest interconnected pedestrianized area in Europe! Today's stage is not very strenuous. Therefore, you can take your time. For a strolling through the old town of Nuremberg. From the outskirts of Nuermberg you ride along an old canal. 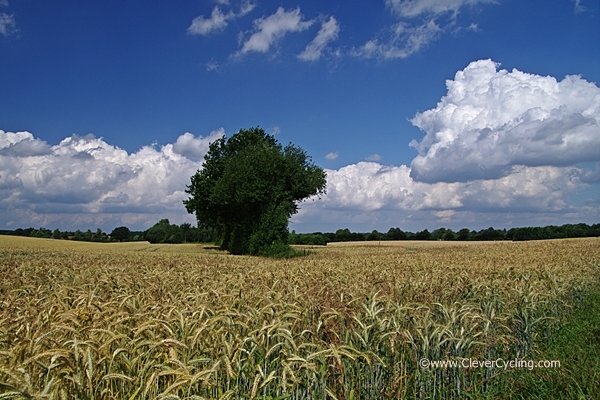 Without Car traffic your bicycle rolls through old, quiet woodland and cultivated land. The small town of Neumarkt is your destination. This city is home of the largest organic brewery in the world (Lammsbräu)! As a reward for your perseverance you get here an excellent dinner in an organic restaurant. The legendary Lammsbräu organic beer you can also test here. and a baroque monastery of national importance. 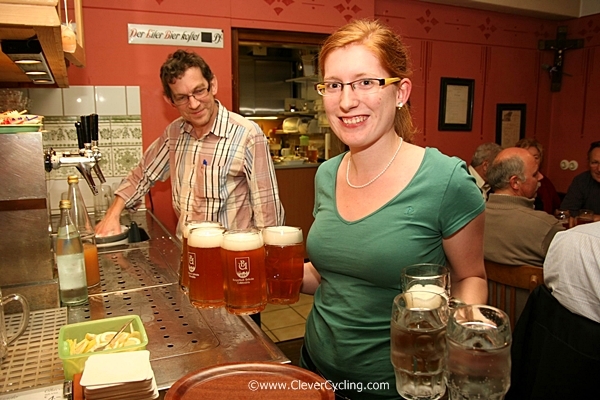 And finally, at the stage finish Beilngries, you can test fine beers from the local brewery. 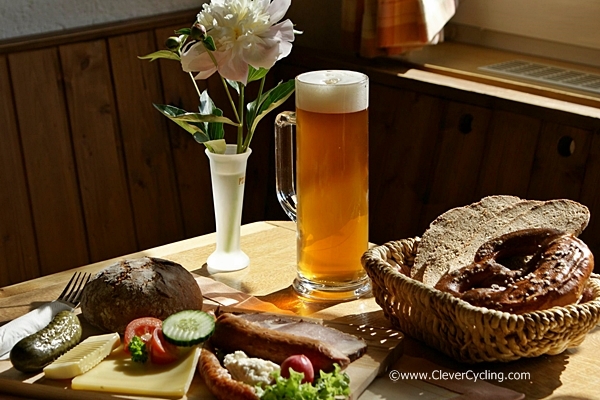 We offer you a good dinner in a traditional Bavarian guest house. The landscape is changing again. Today you drive through a narrow valley with numerous rocks and castles. 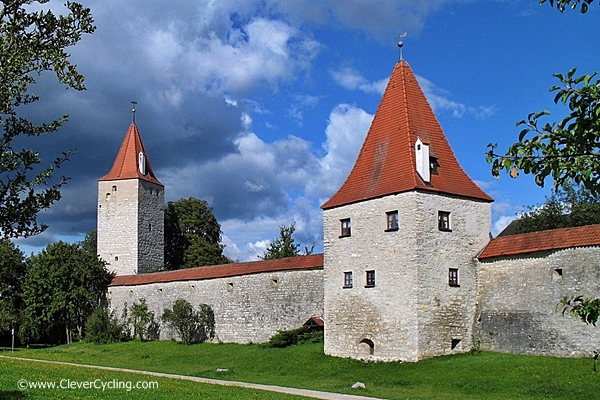 One of the most spectacular castles you can find in Prunn. This fortress is perched on a steep cliff directly above the valley. Another highlight is the village Essing, which is built directly on a long rock wall. There is also the longest wood-suspension bridge in Europe. At the destination you can expect the next beer specialty. 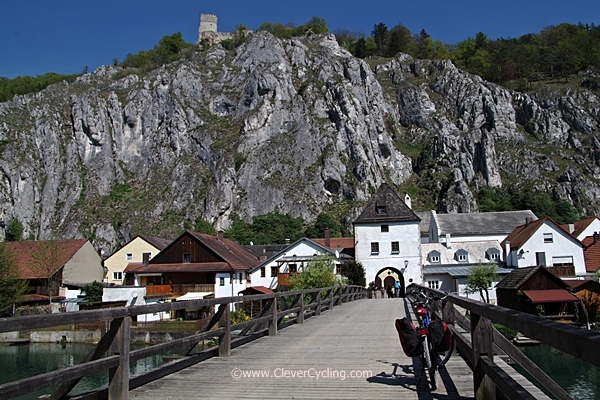 Abandoning the saddle you will hop on a boat to the famous Weltenburg Monastery. 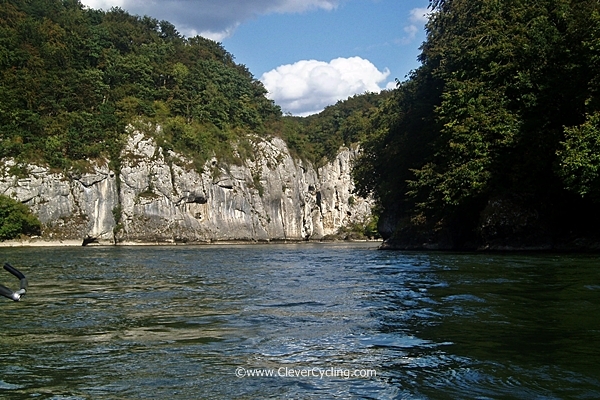 You will pass through the imposing Danube Gorge and come to the picturesquely situated monastery. With a modern train you ride, without having to change, back to Munich. Duration about 1:45 hours. At the end of the journey awaits you an excellent dinner (and beer) in one of Munich's best restaurants in the old town. Our service for you: We are happy to book additional nights for you that you can explore Munichs beautiful City-Center and surrounding. Our special service for you: We are happy to book additional nights for you that you can explore Regensburgs, Nurembergs or Munichs City-Center and surrounding. Desire for something distinctive? Do not hesitate and book now. Family-trip: Please ask for family room! Optional personal support from the airport to the Munich-City center/hotel and back. If you will take one or more of these services, please inform us on the registration form. We make you a personal offer.